The Many Faces of Hibiscus | Faddegon's Nursery, Inc.
Jul 7, 2016 | Perennials, Shrubs, Trees & Vines, What's New? The Malvaceae (The mallows) are a family of flowering plants that includes hibiscus of which there are roughly 300 species so it’s no wonder that there is confusion about their culture and care! Most hibiscus species are tropical, but luckily for us, not all of them are. Some of our well-known garden plants are actually hibiscus or relatives, are hardy in the Northeast and play by the rules of dormancy and winter. Of course, we get to enjoy tropical hibiscus too if only for part of the year. All species of hibiscus share common characteristics. They show big, colorful blooms that come in a stunning array of colors and forms. Another hallmark of the perennial types is their propensity for late summer blooming. It’s not uncommon to wonder why your hibiscus disappeared or died over the winter only to see it spring to life later. They are known for this and have fooled more than one gardener! Not only will you be relieved to see your plant grow and bloom, you’ll be thrilled by what you see! Rose Mallow hybrids have huge faces open to a practically circular shape glowing with color and a deep red eye. The dwarf varieties stand 3-4 feet while the common varieties reach as tall as 5-6 feet at maturity. Ruffled petals or flat, these flowers are nothing short of glorious sometimes reaching an amazing 10” across. The best part? They are perennial hibiscus in our region. Next summer they’ll be back! Don’t despair if you don’t see them coming back in the spring. June is when you’re likely to get a glimpse of an emerging stem. 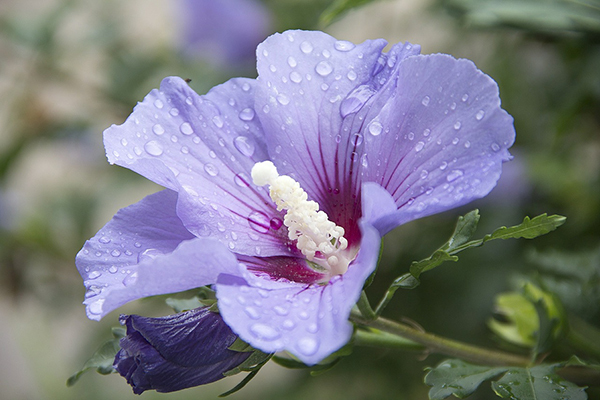 Rose of Sharon may be a bigger plant with smaller flowers, but it is still a hibiscus with the same beautiful funnel-shaped flowers! There are many cultivars of The Rose of Sharon. Mature sizes vary as well as flower color and form. The 3-5 inch blooms can be single or double, ruffled or multicolored depending on the variety. It’s also the only flower of the hardy species to include a blue flower in its palette. Tropical Hibiscus (Hibiscus rosa-sinensis) You’ve seen these beautiful flowers that remind you of your trip to Hawaii (or like me, pictures of Hawaii!) They come to us from warm and exotic places so we can enjoy them outside during the summer months. Availability spans April through June. Tropical is the keyword! They don’t like any temperature below 50°. Many of us can relate to that! Most hibiscus will stay in containers so they can move indoors in the winter as they lack the ability to survive our climate. They are easily “over-wintered” allowing you to keep the same plant for years. Do you need some instructions for over-wintering or keeping them indoors? Follow this link.